Pumpic, the developers, assert that children spend an average of nine hours a day on their mobile devices, obviously a large slice of this time would be checking various social media apps and exchanging information with their friends. Limitly is a comprehensive and quite sophisticated programme to help parents restrict the time on these time sapping applications and get the children to focus in on school work related tasks. The parameters that the parent can set are extremely flexible with the ability to veer from Attila the Hun on one day to Mother Teresa on the next. When the programme is loaded for the first time the user is required to grant admin rights to ensure that full control of timings and downloads can proceed. The user has to ensure that they remember the PIN number for this access and that their children do not know it, otherwise they will be able to uninstall the app! 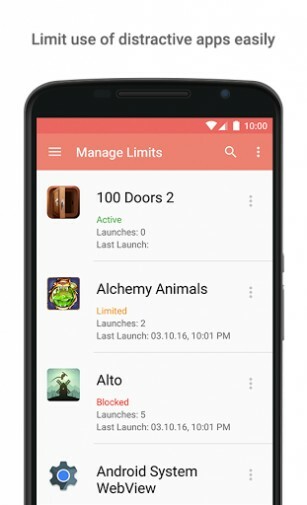 At the heart of the programme is the Block apps and Manage limits facility a simple an intuitive menu system guides you through the process of choosing the applications to block and/or manage the time limits for use. For example the user can limit a favourite social media app on any day of the week for an hour and then two hours a day for the weekend. The device itself can be blocked at any scheduled time a particularly useful feature if you do not want your child to use the mobile from late evening through to the morning. You are also given the facility to customize the messages to your children about the restrictions so that you can remind them in a personalized way of the rule negotiated with them. 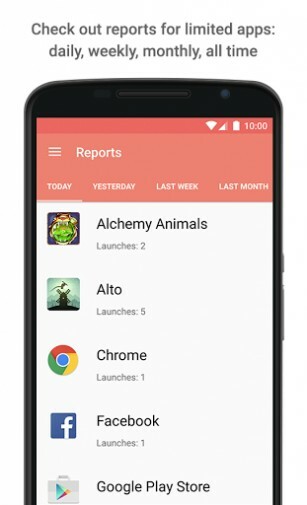 A powerful utility of the programme is the Reports section where the parent can monitor the use a child has made of every app over a given period of time. The information includes the number of times the child has opened the app, ‘Launches’, at what time they launched the app, how long the session lasted and a total time for the use of the app. The reports section also includes information on the number of times the child tried to re-launch the app when the time limit had been used up and the number of times the app was attempted to be launched whilst blocked. Another useful feature is the quarantining of an application the child has downloaded so that the parent has had a chance to review the app before use. 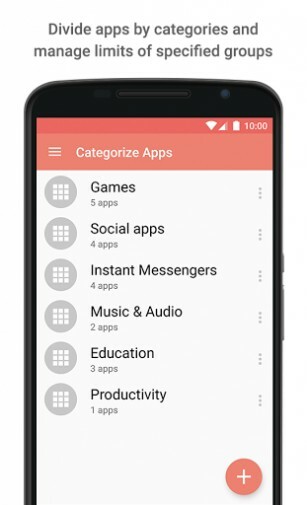 Finally, the facility to categorize applications under chosen headings is useful when setting time limit defaults, especially when you have a number of social media apps to contend with and you wish to attribute the same time limits on all of them. Overall this free application is a very useful utility to store in the digital toolbox of a hard pressed parent or teacher who wishes to guide a child into some focused learning without being distracted by the multitude of exciting but ultimately ‘time sapping’ applications on offer. 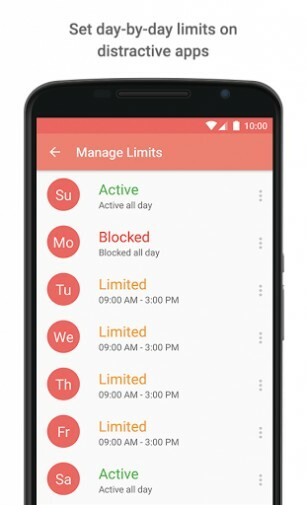 Limitly is a flexible screen time parental control app. It prevents kids from wasting time on smartphones and tablets. With the help of Limitly, careful parents can specify the time, when their children are allowed to use mobile devices and applications on them. Kids spend more and more time on their smartphones and tablets. Statistically, as much as 9 hours a day on average. It results in bad homework performance, troubles at school, and lack of sleep leading to health issues. During installation we ask to grant Admin rights to Limitly app. These permissions allow us to protect the app from being easily removed by kids. The same set of permissions usually can be used to Erase data on devices and you are warned about this. We can assure you that we do not have functionality to delete the data with Limitly app and will not have it in future. Please share your feedback with us to make Limitly even more helpful for you and your children at info@pumpic.com.